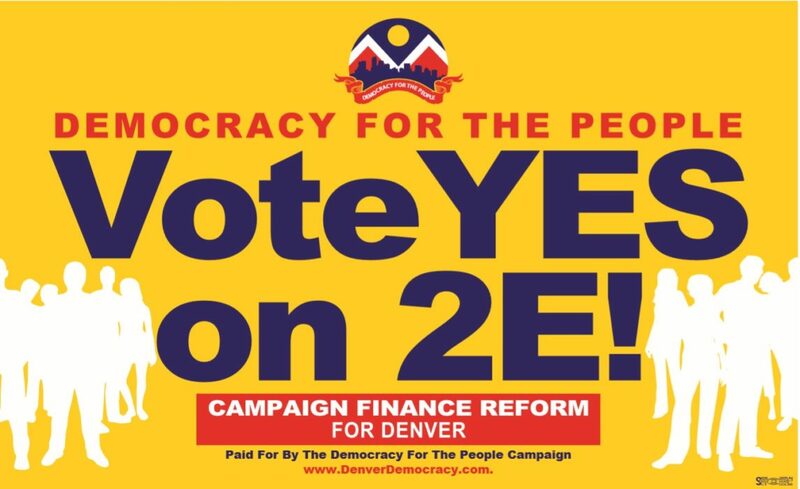 Denver voters took a huge step forward in getting big money out of local elections by passing Referred Measure 2E. Denver voters took a huge step forward in creating a city government that looks more like us and works better for all residents by approving Denver Referred Measure 2E. Citizen-funded elections help to increase participation in our democracy, and give average citizens an amplified voice in local government. What it does: Referred Measure 2E both lowers contribution limits and prohibits corporations from contributing to candidates running for city office in Denver. The measure also creates a Fair Elections Fund which will enable candidates to finance competitive elections without taking special interest money. After proving they are a viable candidate, enrolled candidates will be able to receive matching funds for small contributions for Denver residents from the Fair Elections Fund at a rate of 9 to 1. Our take: Citizen-funded election programs like 2E help break down barriers to participating in our democracy – creating a government that looks like us and works for us. Reforms that provide public matching funds to amplify the role of ordinary Americans in financing elections have made it possible for more women, people of color, and those of modest means to run and get elected to public office. Our role: This is a big win for Denver – and an achievement for Colorado Common Cause, as we helped draft the original ballot initiative language in 2016. This builds on our previous campaign finance work in Denver – including closing gaps that previously allowed independent spending in municipal elections to go unreported, increasing the frequency of reporting, and establishing fines for those who do not comply with campaign finance laws. During the lead up to the 2018 election, we also hosted several phone banks to get out the Yes on 2E message. What’s next: This new rule will go into effect for the 2021 municipal election. Colorado Common Cause will work with the City of Denver to craft the necessary rules for implementation and will also help to make sure that donors and those considering running for office know about the program.